Many organizations either do not try to calculate the cost of employee turnover or, if they do, they find that it is not a simple calculation, especially since these costs don't appear as a line item in their financial statements. However, this doesn’t change the fact that turnover in an organization’s workforce has true costs, whether you try to estimate those costs or not. That’s why we’ve created this simple guide – to help HR managers get their arms around the idea of turnover costs and what they might represent to their organizations. Having this information could help spur development of a meaningful employee retention strategy! Involuntary turnover represents the employees who are let go by the organization, whether for just cause or because of a RIF (reduction in force). Employees who are terminated for cause contribute to turnover costs because they often have to be replaced. Voluntary turnover measures how many employees leave by choice, which can be due to many different factors. “Non-preventable Turnover:” Non-preventable exits occur when employees leave for reasons that are outside of the organization’s control. They may leave because they need to take care of other family members, or because they are experiencing health problems or because they or their spouses are moving out of the area. “Preventable Turnover:” In strong contrast to non-preventable departures, preventable turnover occurs when employees leave because of difficulties they are facing with their jobs or in their work environment. Our exit surveys show that the key motivators of preventable turnover include (i) overall job dissatisfaction, (ii) unfulfilled job expectations, (iii) challenges with performance expectations, (iv) limits within their work situation, (v) problems fitting into their roles or working with their colleagues, (vi) extremely high job stress, (vii) lack of acknowledge for their contributions and, most importantly, (viii) little or no opportunities for career advancement. DID YOU KNOW? BASED ON OUR INSIGHTEXIT SURVEY RESULTS, ABOUT 50% OF ALL VOLUNTARY TURNOVER IS PREVENTABLE. THIS MEANS THAT A SIGNIFICANT PROPORTION OF TURNOVER COSTS COULD BE AVOIDED BY IMPLEMENTING A STRATEGY SPECIFICALLY DESIGNED TO REDUCE THIS TYPE OF TURNOVER. How many employees left your organization in the past year? Of those departures, how many left for voluntarily and how many left involuntarily? Once you have those numbers, you’ll need your average staffing level for the past year. You can get this by adding the total number of employees you had at the start of the year to the total number of employees you had at the end of the year and divide by two. The costs associated with hiring and onboarding new employees. It’s important to remember that, within each of these categories, employee turnover can have both direct and indirect costs, so this guide is designed to help you think about each of these. Let’s start by looking at each of these categories in detail. Any retirement plan contributions that your organization needs to make on behalf of the departing employee. The loss of institutional knowledge, contacts and skill sets that the exiting employee is taking with them. Signing bonuses and/or relocation or moving costs spent to get the successful candidate in place to start their new job. For some positions, a job vacancy can mean an actual loss of revenue to the organization. Sales is one likely source of lost revenue but this can also apply to other positions, such as physicians and specialists in a medical or dental practice or a loss of billable hours in a law firm and even hairdressers if a station is left vacant! The costs to prepare the necessary orientation materials and supplies as well as the training materials required for that particular position. Once you start the process of estimating and adding these expenses up, you’ll quickly see that the financial impact of employees leaving can be very high. 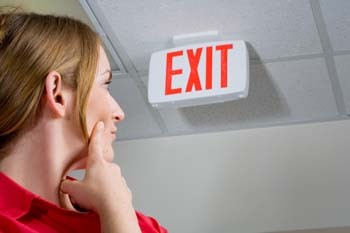 Although we're not suggesting that all employee turnover should be prevented, our goal here is to get organizations to recognize that they can benefit from (i) recognizing what factors are leading to “preventable” exits so that (ii) they can implement a smart and effective program to prevent other employees from leaving for similar reasons. In fact, a well-executed strategy of employee retention can easily and quickly pay for itself by preventing even just a few valuable employees from leaving their jobs. Calculate it for your own organization here. An important step in the process of creating a retention program is to use the InsightEXIT system to get a real handle on both your preventable and non-preventable turnover. With its easy-to-use management portal and real-time reporting capabilities, the InsightEXIT system can give you the information you need to increase retention and cut down on your turnover costs. You can learn more by visiting www.insightexit.com, by calling 866-802-8095 ext. 705 or by emailing info@insightlink.com.